Product code: ES8319 Categories: Art Deco, Art Deco Rings & Art Deco Engagement Rings. 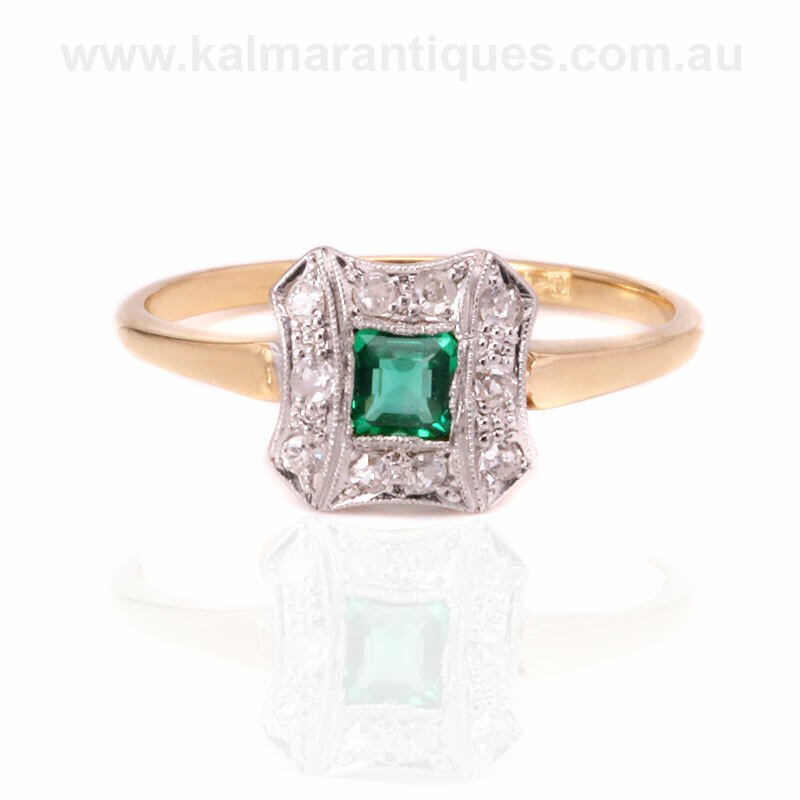 Here is such a beautiful and elegant 18 carat yellow gold and platinum Art Deco emerald and diamond ring, that would so easily suit any finger and occasion, including making a wonderful engagement ring. Quite often Art Deco jewellery took an existing design and altered it in a subtle way such as this ring here. Taking the traditional cluster design, not only is it more of a squared shape as opposed to round, but the sides have the most wonderful hour glass style shape to it. Measuring 8.2mm by 8.1mm, it leads to the yellow gold band which itself is so elegant and compliments the design perfectly. Sitting proud in the centre is a vibrant natural emerald that measures 0.16 carats and has not only a perfect green colour to it, but exceptional clarity allowing you to see right through the emerald. Highlighted by a border of ten single cut diamonds that total 0.10 carats, the edge of the setting has the millgrain finish which can be seen as the elegant crimping along the edge. The design, the emerald and diamonds, and the quality of hand making all come together to create a very beautiful Art Deco ring. Tag: Art Deco emerald and diamond ring. This ring would make a wonderful example of a genuine Art Deco engagement ring and always be loved and admired.